God's basic institution is the family, and the Biblical family lives and operates in terms of a calling greater than itself - the Kingdom of God. In an age when the family is disparaged, warred against, and treated as a mere convention, it becomes the duty of Christians to bring God's plan for the family to listening ears. 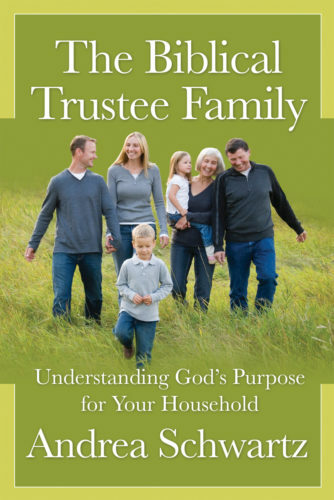 That's what Andrea Schwartz has accomplished in this collection of essays on The Biblical Trustee Family. Stemming from her long years in homeschooling. Andrea elevates the Kingdom mandate as the driving purpose behind God's creation of the family, and the family's central task: education. Her passion is to equip Christian families - especially homeschooling mothers - not only with the tools of learning, but the tools of dominion.